* Buy knives by the piece, not in a block or a set. 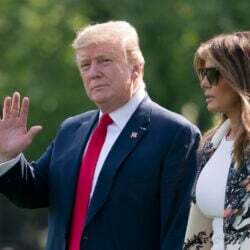 Most knives in a set are never used. Start with a standard chef’s knife (a guyuto in Japan) and a petty knife – a small utility knife also of Japanese design. 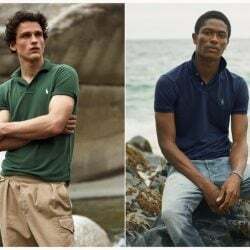 Those two will cover 90 percent of uses. After that you can branch out into specialized knives designed for the particular foods you prepare. * For a knife that fits your hand, try a Japanese knife. 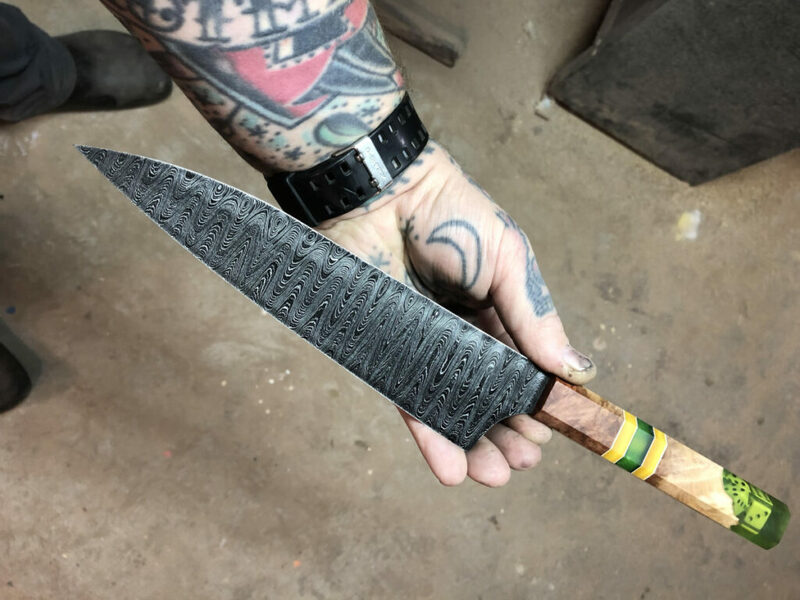 The handles come in a wider variety of shapes and can be switched out for other handles that are shorter, longer or denser to change the knife’s balance point. * Use wooden cutting boards. 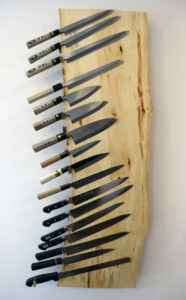 Atwell likes hinoki wood, a Japanese cypress that is antimicrobial and soft enough to absorb a knife edge. Do not use bamboo or glass cutting boards, which damage knives. * Always hand wash your knives. Never wash them in a dishwasher. To prevent chipping and scratching, hand-dry them. 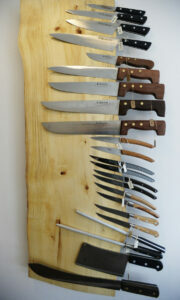 * Magnetic knife strips are the best visual, space-saving and practical way to store and display knives. The blades are visible and they just “look cool,” Atwell said. On a strip, most of the knife’s surface area is exposed to air, so any residual water after washing will evaporate or drip off. With a knife block, water can soak in and rust the blades. 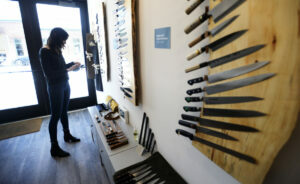 He placed a 10-inch Sabatier chef’s knife, priced at $100, in a visitor’s hand. The knife was, indeed, shockingly light – as light as a French croissant next to a German potato salad. 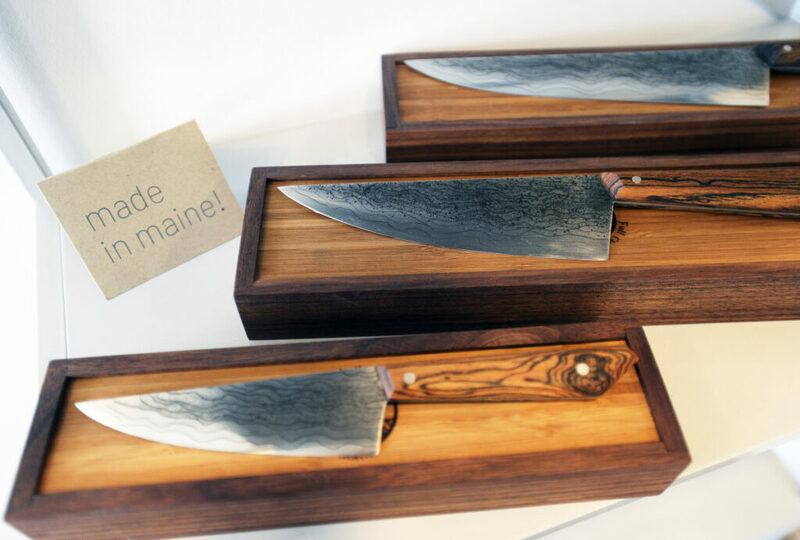 Strata offers Maine knives for sale, including the colorful, handmade ones from Grimm Knife Co. in South Berwick. 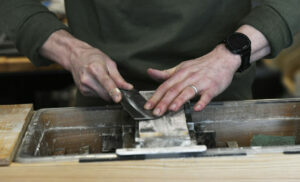 Photo courtesy of Grimm Knife Co.
Atwell and Wurwarg have lived in Portland for two years. They moved here from San Francisco, where they both worked in the food industry, Atwell managing a food market and Wurwag working at Dandelion Chocolate, a bean to bar chocolate maker. 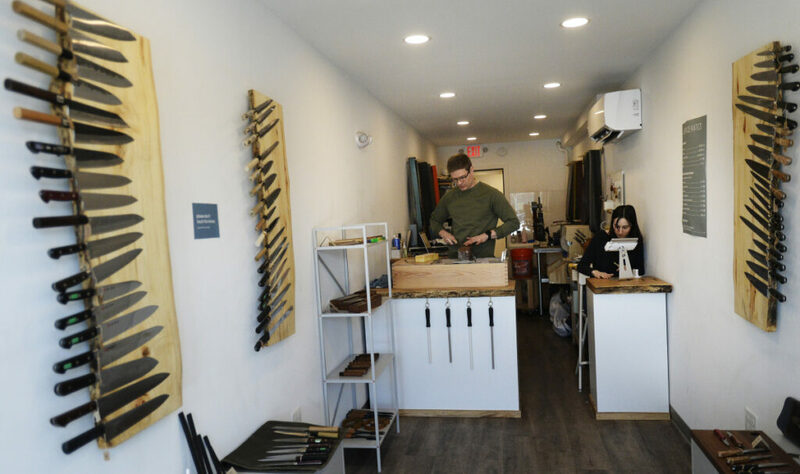 Maine-made knives on display at the knife shop Strata in Portland. These knives are made by Full Circle CraftWorks.